Over the past couple of years I have sailed four RS Aero regattas in Florida. 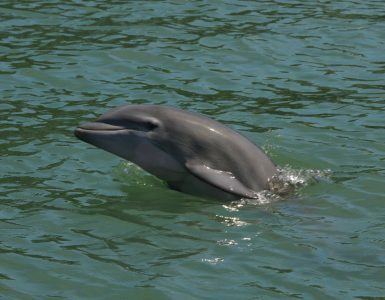 Last weekend’s 2019 Florida State Championship in Jensen Beach was by far the most enjoyable… for all sorts of reasons. Sailing is a silly sport. You can’t sail if there is no wind or there is way too much wind. So, when you sign up for a charter boat and hotel and flights etc. to go and sail a regatta over a thousand miles from home you are always taking a chance with the weather. Of the previous three Aero regattas I have sailed in Florida, one only had a small number of races, all in incredibly light winds, one had the last day cancelled because of no wind, and the other had the last day cancelled because of too much wind and heavy rainstorms. But this weekend Florida delivered (almost) perfect conditions. OK, we had a bit of rain during the clinic on Friday but we did have wind. And for the racing on Saturday and Sunday we had wonderfully warm sunny weather with winds from about 6 to 12 mph. We completed five races on Friday and three on Saturday. Thank you Florida. I had never been to the US Sailing Center of Martin County before but I have to say that it is one of the best locations for a dinghy regatta I have ever known. There are plenty of grassy areas to rig up and launching is off a sandy beach. The staff and volunteers at the center were friendly and welcoming and the race management was excellent. And I was pleasantly surprised to discover that even on a Saturday and Sunday in the middle of what I assume is the peak season for boating in Florida there was very little powerboat traffic on the Indian River. 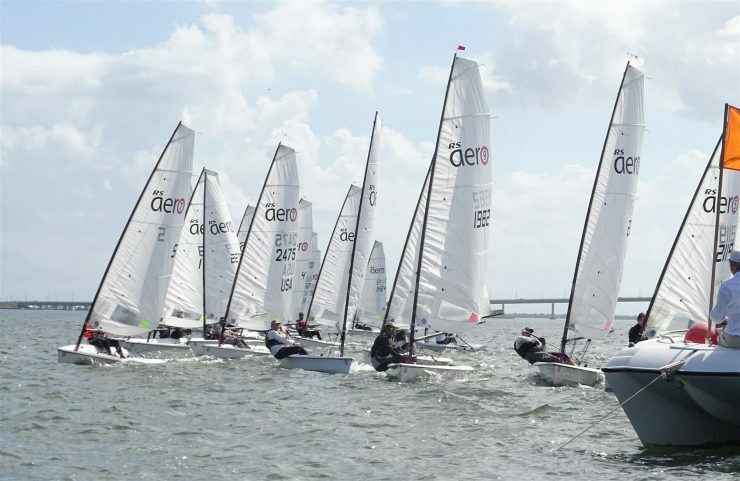 I think I am right in saying that the 25 sailors who raced in this regatta set a new record for the largest attendance at an RS Aero regatta on the east coast of the US. I like to see the class breaking records. I hope we break this record again soon, if not at the Midwinters in Palm Beach SC next weekend or at one of the two Aero regattas in Florida in March, then we will just have to pull out all the stops to do it in June at the Small Boat Regatta at my home club, Massapaog YC in Sharon MA, home of the first, the largest and the most fun RS Aero regattas in the north-east. You can register now at http://www.regattanetwork.com/event/18195. Where was I? Where am I? Oh yes, I am supposed to be writing about the regatta in Florida last weekend. Perhaps the second best thing about RS Aero regattas (second only to sailing the coolest boat on the planet of course) is spending time with other RS Aero sailors. I suppose the fact that all the sailors have bought RS Aeros or are thinking about buying RS Aeros means that they are inevitably curious, adventurous folk who are open-minded enough to consider stepping up from whatever class (or classes) of boats they have been sailing before (some times the same boat for decades.) Whatever the reason, they are good people who are a pleasure to race with and to hang out with before and after racing. It was also gratifying to see a number of youth sailors sailing RS Aeros at this regatta. It seems that, at least in Florida, young sailors (and their parents) are starting to see the RS Aero as a natural progression from Optimist or O’pen Bic. There was a strong contingent of sailors from New England at the Florida State Championships with New Englanders taking four of the top eight places. Marc Jacobi of Cedar Point YC in Connecticut, sailing an RS Aero 9, was the overall winner on handicap with Jim Myers and Tim Desmond also in RS Aero 9s in the top eight. But perhaps the most impressive performance of the weekend came from Ralph Kinder of Bristol YC in Rhode Island. I know Ralph as one of the top sailors in the Laser fleet at Bristol, both in the Tuesday evening racing in the summer and in the Saturday afternoon frostbiting in the winter. 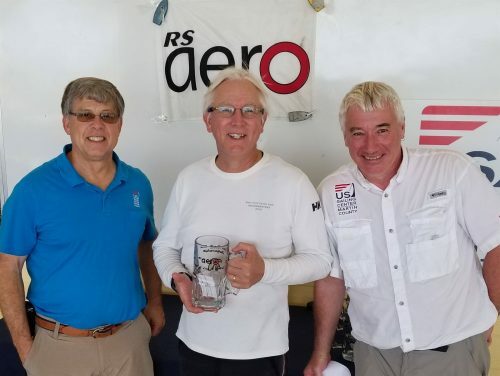 Sailing a charter RS Aero in Jensen Beach, Ralph not only took first place in the 13 boat strong RS Aero 7 fleet he was also tied on points for third place in the overall handicap scoring. A stellar achievement for someone who does not (yet) own an RS Aero. Apparently news of New England’s success in Florida at the weekend had spread back home. As Tillerwoman and I were driving home from the airport on Monday afternoon we saw a huge billboard in Providence that read.. Anyway, enough of my muddled rambling. Here is a video of day 1 at the regatta that sums it all up better than I ever could. Check out Indian River Blues – Going Up Slow for an account of my own (mediocre) performance in the regatta. Learn from my mistakes!